Owners of small bathrooms and en-suites may be familiar with the daily struggle to maintain a tidy and well-organised bathroom. However, a well organised space isn’t just for people with large bathrooms and homes. Whether you’re a renter or a home-owner, there’s always something that you can do to maximise the space in your small bathroom. Accessorise your bathroom with hooks, tiered storage or storage baskets, all of which look sleek and modern alongside bathroom wall panels. These five space saving bathroom ideas are perfect for reorganising your space and making the most of what you’ve got. Choosing storage for the bathroom can be difficult, especially when you’re tight on space. Tall-tiered storage is an excellent storage solution for both renters and homeowners with smaller bathrooms, as it makes the most of wall space whilst minimising the space taken up on the ground. Be sure to attach the storage to your wall to prevent toppling – particularly important if there are young children in the house. Tiered storage for bathrooms is perfect for storing towels, toiletries and spare toilet paper. Over the door hooks are ideal for creating space in rental homes where you may be hesitant to drill into the walls. Store towels, dressing gowns or even storage baskets on the back of the bathroom door to fully utilise the space afforded to you. Hooks with adhesive backing are also perfect for rental properties as they don’t cause structural damage. Strong hooks can hold up to 1kg in weight and are perfect for adding to wall panels to hang your dressing gown, face towel or washbag, freeing up cupboard space. 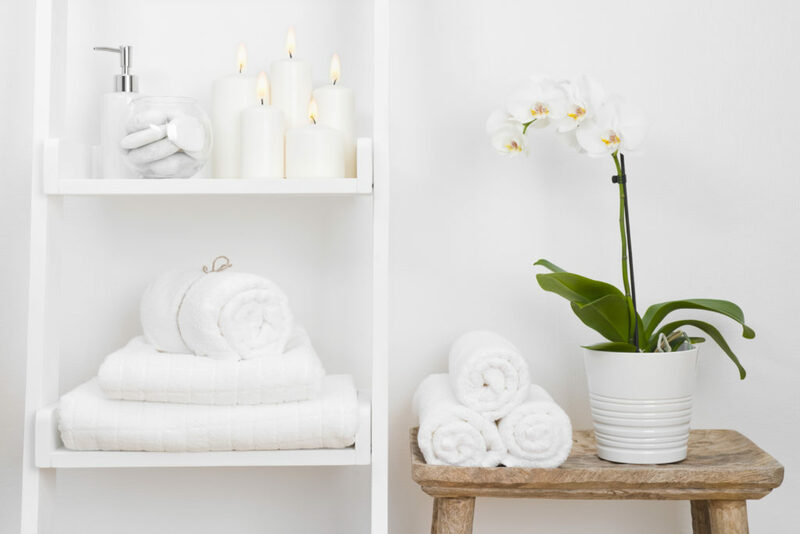 Like any room in the house, bathrooms can accumulate clutter over time. To organise your cupboards, remove everything and put it on the floor where you can see it. Divide the pile into three categories: currently in use (to keep), to use in the future (to store away) and finished or unwanted (to throw away). Unwanted and unused toiletry gifts just add to the clutter – so split them up and tidy them away into categories according to use. If you have under the sink storage, consider buying a tension rod to hook spray bottle cleaning products over, this will free up storage at the bottom of the cupboard for toiletries – you can divide it up further by using storage baskets. If there’s always bottles of shampoo and shower gel around the outside of your bath, they could be accumulating mould and mildew. A bath bridge or caddy allows you to store things you use daily in a place that keeps them out of the way of water. Wire bathroom storage can be drilled into wall panels, but if you want something less permanent, buy strong suction cups to keep them in place. Storage baskets are a great way to tidy unnecessary clutter. Place them on the windowsill, inside cupboards or directly on the floor. Perfect for storing small bathroom accessories like bath bombs, cotton balls or face cloths, they keep things looking tidy. Make sure to organise each storage basket so you can see its contents fully – that will keep you from buying things that you already have. This entry was posted in Information & Advice. Bookmark the permalink.